“3 tigaada kaam bigaada” is a Hindu proverb; we are hearing since childhood and might not know even why this is believed to be inauspicious and unfortunate in Indian culture. This hindi epigram- 3 tigaada kaam bigaada is a short, well-known pithy saying, stating a general truth in an amusing way. However, the number 3 is considered threateningly ominous yet has hidden symbolic importance of its own in Hinduism. This number 3 also gives the worrying impression that something bad or inapt is going to happen in time to come. Though, it pretty much depends on how we take this ancient superstition belief. Here are some of the old wives’ tales about the number 3 that reveals the great significances and values. 1- Lord Shiva is the third divine godhead in the Trinity (Brahma, Vishnu, and Mahesh) and Mahesh is believed to be the supreme and has ultimate power. Therefore it is said: Treeni Treeni vi devanamruddane Treeni chandagumsi Treeni savanani treya ime lokaaha. 2- Secondly, Lord Shiva being the sovereign deity is known to have trinetra (three eyes) which signify- Satt, Chit & Anand (truth, conscience &happiness). 3- Bilva leaves are used for showing reverence and adoration to Lord Shiva in his lingam form has three sub-leaves. Number 3 is often taken in pious sacraments as a divine token of godheads and their strengths. It is believed that the number 3 is a symbolic depiction of Ohm (Aum) in Hinduism. Hinduism also beleives in Lord Dattatreya, here treya means three (3). Although, number three is always considered auspicious and vigorous while taking circular rounds around the temple premises and thus devotees prefer taking 3 circles to pay homage to gods. It was conventionally reckoned that there are three qualities (Tri-Gunas) defined in Hindu Shashtra- Satva, Raja and Tama. Venerating three sublime goddesses, Laxmi, Saraswati and Parvati are appraised quite pious since these three female deities are together considered to be most powerful in Hinduism. In a temple, after offering rituals and prayers to graven images, the leading priest propounds holy water thrice to the devotees present inside the main sanctum. Offering prayers to three rivers- Ganga, Yamuna and Saraswati whose confluence is known to be ‘Tri-veni Sangam’ are way sacred. There is Tri-Loka (three worlds) concept in existence. The Heaven (sky), the Earth and the Hades aka underworld (Pataal). Hindu Shastras surmises Trikal Sandhya which implies- worshipping divinities three times a day- morning, afternoon and night. 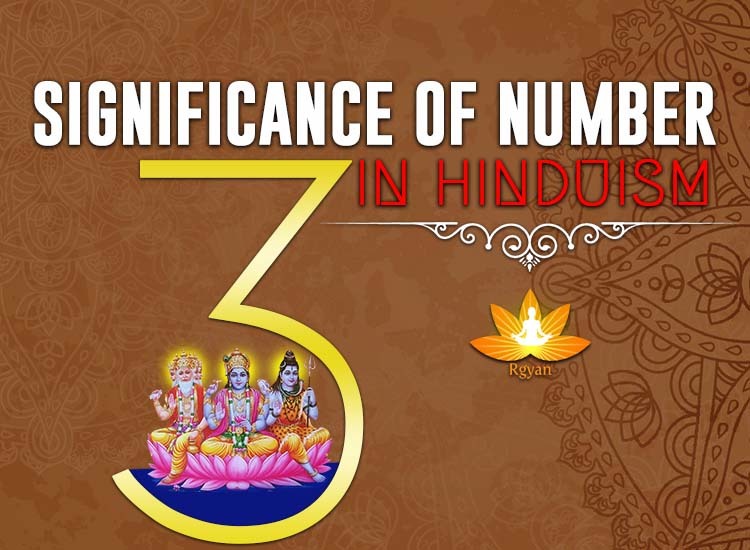 Hence all the doubts have now been cleared that number three is not considered bad in Hinduism in any aspects. This number is however the most favourable and sanguine and does not exhibit bad omen in Hinduism. On the contrary, there are a lot more superstitious beliefs that sometimes are meant to yield bad luck or misfortune to a certain extent. Instead, science has not yet proven these bad omens’ and superstitions’ impacts consequences and causes. The number 3 in dreams is way menacing and is destined to fetch misery and distress. Number 3 omen is if you notice 3 butterflies in a flock, it is an indication of bad luck. three knocks in the room of a dying person is a harbinger of death. If anytime an owl yowls 3 times, it brings in unhappiness and sorrow. If three persons light a cigarette from the same match stick or lighter while smoking, one of them would get murdered or killed. 3 candles or lamps if flaming in a room is considered ill-stared and hapless. A famous omen utters: Deaths come in threes. Have we ever thought about this superstition why do deaths come in threes and is it really true that deaths come in threes? Yes, it is supposed to be true as Psychology has earlier proven this three death logic on a basis of real- life survey. Death always comes in Number 3. On account of it, number 3 in Hinduism is a sign or warning that a momentous or calamitous event is likely to happen that may cause death next. Possibly, it is not something supernatural, paranormal or magical rather sounds mysterious and baffling nevertheless. Next articleWhy Polygamy is not allowed in Hinduism? Mythology Of Lord Jagannath – Discovery Of Lord Krishna’s Heart!